Hurricane Katrina has left Louisiana devastated. More than half a million people’s homes have been wrecked beyond repair; the dead number in the thousands; and New Orleans will cease to exist as an inhabitable city until 2006. America has watched one of its most celebrated cultural centers decay within days into an anarchic battleground scourged by human suffering, looting, and murder. But the worst of the storm is over. Now, in this period of crisis management, recovery, and rebuilding, MIT has both the opportunity and the responsibility to use its position of national prominence to help the victims of Katrina. The Institute has made its initial response. President Hockfield issued a public statement (http://web.mit.edu/katrina/). Counseling services, both emotional and financial, are being provided to MIT students directly affected by the hurricane. The Institute has offered to enroll a limited number of displaced college students. MIT has also issued a list of experts available to the media for comments (http://web.mit.edu/newsoffice/special/hurricanes-experts.html). Additionally, organizations across campus have begun individual relief campaigns. These initial efforts, however, while a start, are insufficient. As a national leader in science and technology, MIT has an obligation to share its talent. It is not enough for the News Office to provide a list of faculty members available for interviews; instead of merely serving as sound bites for the media, MIT researchers should be sent on paid leave to support the cleanup effort. The Public Service Center is awarding fellowships to those offering their assistance over Independent Activities Period, spring break, and summer 2006; this action is admirable but inadequate. Urgent engineering problems involved in restoring power to hundreds of thousands of residents, removing deadly toxins from the water, and safely draining a flood zone require our expertise now. More complex problems face New Orleans in the coming months, as city leaders prepare to rebuild a ruined infrastructure and a ravaged city. Here, too, MIT can provide the assistance the city desperately needs. The Department of Urban Studies and Planning is a natural resource for the long-term restructuring the city will need. Regenerating a shattered economy could be made easier with help from the Sloan School of Management. Though these concerns do not need immediate solutions, the Institute must not ignore or forget them in the coming months, and must consider the questions today. The Institute should also offer a solid commitment to its goal of admitting some of the estimated 100,000 students displaced by the hurricane. In her statement, President Hockfield followed dozens of national universities in pledging that the Admissions Office will consider applications for temporary study “on a case-by-case basis” until Sept. 9. This offer, made in earnest, must be executed to the best of MIT’s ability. When dormitories already face crowding, with so little time to evaluate applicants’ merits, and in light of the terrible pressures facing many potential applicants, whether MIT will really play host to many or even any “Katrina special students” is unclear. Should students apply that the Institute cannot accommodate, we urge Admissions to keep in touch with all applicants and ensure that their education continues elsewhere. 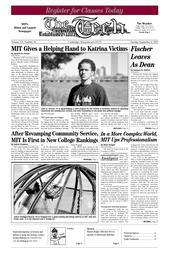 Finally, MIT should use its clout as a national university to directly help the victims of Hurricane Katrina. The PSC, along with countless student organizations, is to be praised for promptly coordinating fundraisers. But here, too, MIT could do more. Harvard is matching donations of up to $100 made by faculty, staff, and students; if the Institute cannot afford to match donations, it should seek a sponsor who will do so. Such an incentive would at the least double the value of contributions from within MIT and could even provide a reason for more people to donate. However the Institute acts, it must make its plans quickly, announce them clearly, and arrange them coherently. There should be tight, effective coordination among the varied campus groups working on the relief effort, or time and money will be wasted on internal administration. MIT should start addressing the long-term urban and structural rebuilding of New Orleans now, rather than months later, so that the relief effort can progress seamlessly from short-term solutions to long-term reconstruction. The nation is mired in crisis; with careful leadership and steady guidance, MIT can help. The effort must be tangible, sincere, and ongoing.